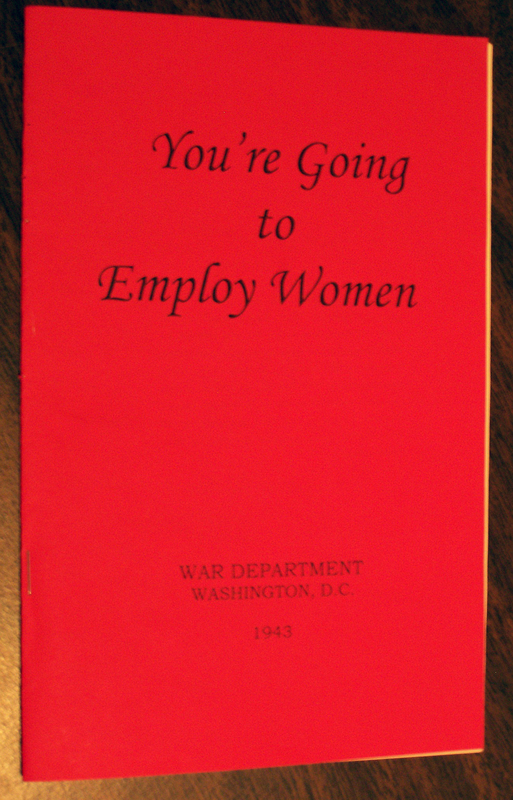 One of my friends has had to clean out a recently deceased relative’s home and she has found several gems, including a copy of “You’re Going to Employ Women,” a pamphlet issued by the U.S. War Department in 1943 to its personnel offices (her relative worked in personnel at the Pentagon). 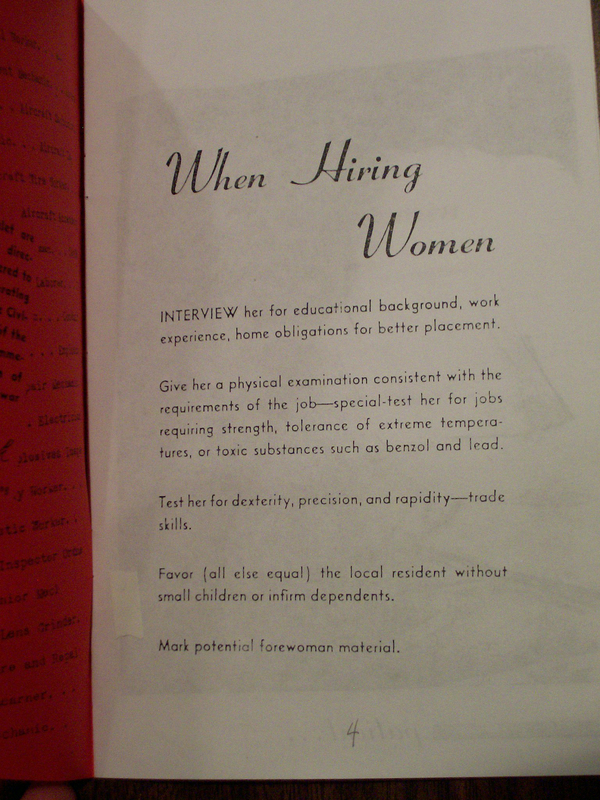 During the 1940s, with so many men off to war, women needed to be hired for positions traditionally held only by men, including in industries like manufacturing. This is the era that spawned the iconic Rosie the Riveter image. The prospect of hiring women must have struck fear into the hearts of the many men left behind. 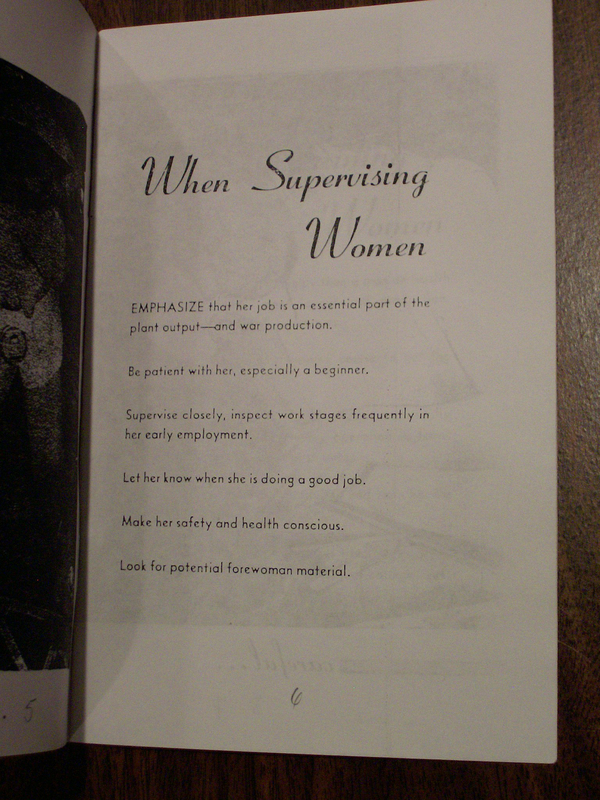 Pamphlets like the one detailed here were created to helpfully guide them through the hiring and supervising of these creatures. 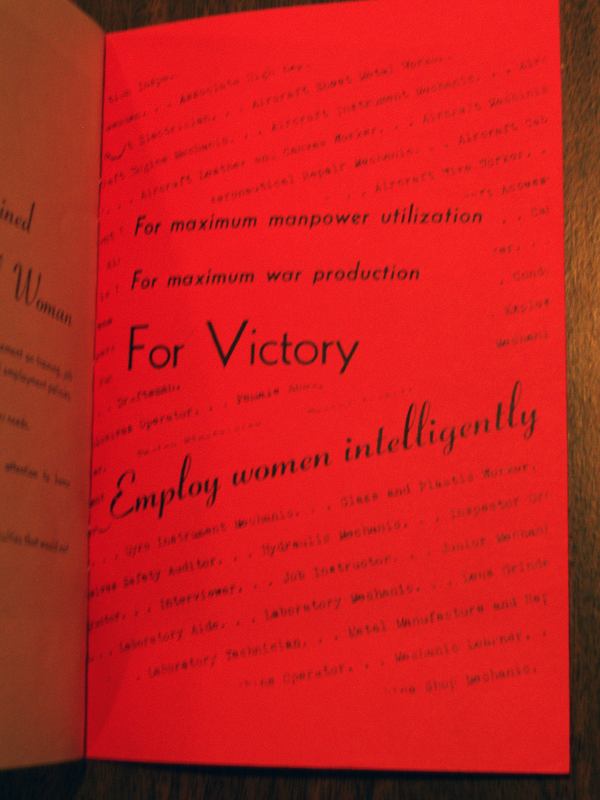 "For Victory -- Employ women intelligently." I ate nachos way too late last night and hence was awoken by very strange dreams early this morning. But the early bird gets to breakfast with Thomas MacEntee, and I also got to meet Chris Whitten of WikiTree. Caroline Pointer joined us as well. I was able to attend this morning’s keynote talk by the Ancestry guys led by CEO Tom Sullivan, and they showed some really promising demos of things to come from that site. Next, I attended Is Your Ancestor Hiding in This Picture? by Patricia Moseley Van Skeik of the Public Library of Cincinnati. This was a follow-up to her talk last year about the 1848 panoramic daguerreotype of Cincinnati. This year, she showed the results of their research into the various buildings and businesses pictured. Really good, inspiring stuff for this photo researcher. Then, I attended the fold3 overview and learned a lot of new ways to use this service. Their Training Center features videos by Laura Prescott (she also wrote a lot of the collection descriptions). Check out fold3’s listing of all resources, which shows the completion status of digitization for each collection. Go to the information page about a collection to search or browse just that collection. You can browse by conflict on the homepage, which is very handy for eliminating irrelevant records. When you are in a set of search results, use the Watch feature to send you alerts when possible new records are found for a particular person at a particular place. You can check out which other users are adding information to pages for particular people or annotating particular records and connect with them. You also can upload an image about a person that’s related to other docs and/or their page on fold3. Anything that users upload is free for others to view. One really nice feature of fold3 is the ability to create memorial pages. Users can create pages for places and organizations, not just individuals. I had a nice lunch with Linda McCauley, Jenna Mills and Caroline Pointer at Blue Lemon before skipping the last session to get in some last minutes of research at the FHL. That was not going so well, so now I’m back at the hotel, watching my Terps. Will be heading out later with a LibraryThing friend who lives nearby. Stay tuned for more posts from me including my best-of tips that I learned at RootsTech and my overall thoughts on this year’s event. Something for me to work on during the long flight tomorrow. 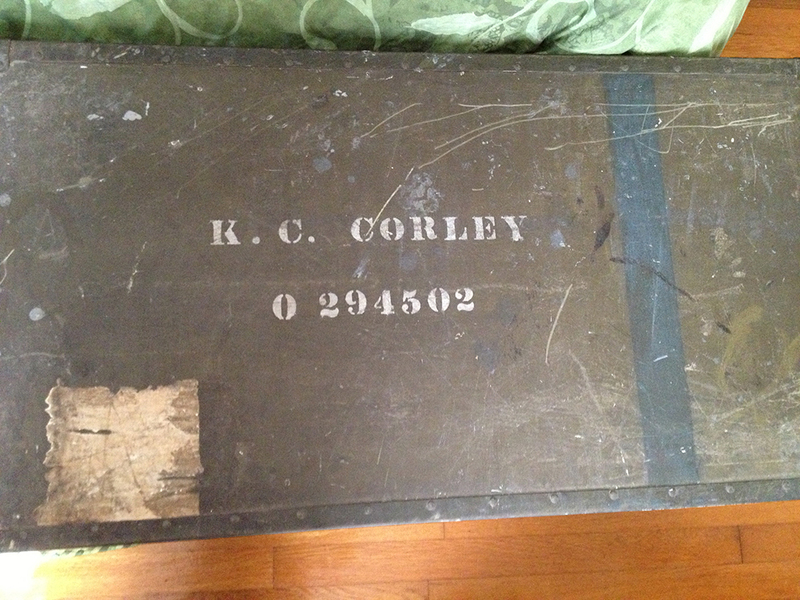 This is the final post in a series in which I’ve transcribed a document that belonged to my father titled “History of the 81st Field Hospital.” It details the hospital’s preparations in the U.S. before deployment and operations in Germany during WWII. This field hospital eventually reached German concentration camp survivors. Read from the beginning here. On 18 November 1945 orders were received by the 81st Field Hospital Headquarters (at Crile General Hospital, Cleveland 9, Ohio) to the effect that this unit would be redesignated the 276th General Hospital and that the considerable reorganization involved would take place at the earliest practicable date. 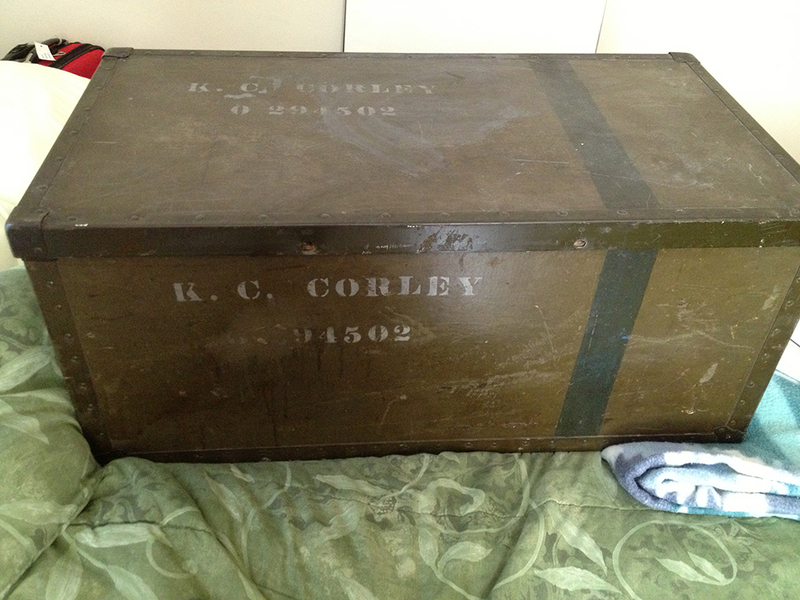 However, the official existence of the new unit was not reflected in the morning report until 11 December 1945. On this same date, Major John B Moring was named Commanding Officer of the new organization. There was relatively little immediate change in the unit. Men eligible for discharge continued to be separated from the service; others, ineligible for discharge but likewise ineligible for overseas service, were to be trfd to other organizations. 60 enlisted men were awarded the Good Conduct Medal pursuant to GO #3, 276th General Hospital, dated 26 December 1945. The additional personnel authorized by the new T/O were slow in arriving, and by 31 December 1945 there remained in the unit only six officers and fifteen enlisted men eligible for overseas service. Captain Milton B. Smith was transferred to Crile Gen Hosp on 17 Dec 45 pursuant to 10/292 War Department Washington DC dtd 8 Dec 45, thus transferring the last Medical Officer from the outfit with a surgical background. This is the eleventh in a series of posts in which I’m transcribing a document that belonged to my father titled “History of the 81st Field Hospital.” It details the hospital’s preparations in the U.S. before deployment and operations in Germany during WWII. This field hospital eventually reached German concentration camp survivors. Read from the beginning here. Packing and crating was completed ahead of schedule and from last week in July until embarkation date, 9 August, a training program was in effect, consisting of classes and swimming, volleyball and other supervised sports. On 9 August, the unit boarded USN Transport General George O Squier, bound for Manila, Philippine Islands. Only detail for the unit was dispensary assignment. In the wake of continual suspense and excitement, beginning with loosing of the first atomic bomb on Japan, the entry of Russia into the war against Japan, and semi-official reports and rumors of peace, Japan finally surrendered unconditionally on 15 August and there was great jubilation aboard ship. Even more enthusiastically received was official notification that the ship’s destination was changed and we were bound for the United States, our port, Norfolk, Virginia. Administrative detail to facilitate possible furloughs, discharges, or other plans for the organization were completed on board ship and we docked at Norfolk on 20 August, proceeding to Camp Patrick Henry for further orders. Groups were sent to appropriate reception stations from Camp Patrick Henry on 21 August with orders to reassemble as a unit at Camp Sibert, Alabama. Temporary duty was extended for a period of 15-days and the unit began reassembling 12 October. Those eligible for discharge were not returned from reception stations. The remainder of the unit completed assembling 23 October. In mid-October movement orders were received directing that the 81st Field Hospital proceed to Crile General Hospital, Cleveland, Ohio. Further instructions directed that the remaining nurses and those enlisted men with an ASR Score above 59 be separated from the unit. On 1 November 1945 the unit entrained at Camp Sibert, Alabama, and proceeded to Cril [sic] General Hospital. The operation had been well-planned and was accomplished with singular smoothness. Upon arrival at Crile, the personnel of the 81st, with the exception of the Headquarters Section, were assigned to on-the-job training assignments in virtually all departments of the splendid general hospital. The experience of our men, abetted by the genuine consideration manifested by the administrators of Crile General Hospital, rendered the merger of personnel effective and harmonious. A separate 81st Field Hospital Headquarters was set up by Major Moring and his staff. All administrative matters pertaining to the 81st were handled by this headquarters. On 14 November 1945, Major Moring received orders transferring him to Wakeman General Hospital, Camp Atterbury, Indiana. Captain Naif L Simon, next ranking officer in the unit, assumed command 20 November 1945. However, the following day, Major Moring’s orders were rescinded and he resumed command of the 81st. This is the tenth in a series of posts in which I’m transcribing a document that belonged to my father titled “History of the 81st Field Hospital.” It details the hospital’s preparations in the U.S. before deployment and operations in Germany during WWII. This field hospital eventually reached German concentration camp survivors. Read from the beginning here. A 250-bed hospital was set up and a typhus immunization team and insect extermination team sent through Allach Camp. In a period of 24-hours, 9400 typhus immunization were given. However, before any official admissions to the hospital were made, orders came to move to another site 15-miles away. The contemplated site however proved unsatisfactory for a hospital and Seventh Army permission was grated for the unit to select its own site. A German military hospital in Goggingen, formerly a Catholic school and nun’s cloister, was selected. Fifty of the 211 German patients were evacuated immediately and the rest as soon as they were transportable. A 100-bed hospital was set up to admit American GI’s from the Munich-Augsburg sector. The average census was 80-bed patients, but a high of 92 was recorded. Many patients were treated in the dispensary. Unit B’s stay at this location was the only time that American GI’s were admitted as bed patients to the 81st Field Hospital during its stay in the ETO. On 5 June, orders were received to evacuate all patients to other US Army hospitals in the region and close the hospital. After the units separated at Dieberg, Headquarters Unit made a number of moves setting up at points as nearly as possible equi-distant from the various units and at the same time in close proximity to Army Headquarters. This was thought more effective than setting up routinely adjacent to or with any of the operating hospital units. On 11 June 1945 unit departed Schwetzinger, Germany, via train for staging area at St Victoret, France. After a three-day trip by converted boxcar, the unit arrived at the staging area, one of the first to reach the rocky dust-swept bowl off the Mediterranean Coast. The men were quartered in pyramidical tents while the nurses remained in Marseille where they were billeted with the 235th General Hospital. For several weeks, the unit was at rest. During the month of June organizational strength remained static, despite changes, with a total of seven enlisted men lost and seven gained; two officers lost, two gained, and two nurses lost and gained. Notable event during July was the accidental shooting and woulding [sic] of Lt Col Banks, Commanding Officer, resulting in his hospitalization. On 26 July, Major John B. Moring assumed command of the 81st Field Hospital and Lt Col Banks was released and transferred the following day. Lts Anne Y Williams and Betty J Snead were promoted to 1st Lt. In the last week of July, unit began packing and crating of equipment for overseas shipment. Except for addition of a Red Cross worker, no strength changes occurred, the unit gaining 12 enlisted men for an equal number lost, and five officers for five transferred out. This post contains details some may consider graphic. This is the ninth in a series of posts in which I’m transcribing a document that belonged to my father titled “History of the 81st Field Hospital.” It details the hospital’s preparations in the U.S. before deployment and operations in Germany during WWII. This field hospital eventually reached German concentration camp survivors. Read from the beginning here. There was no building fit to establish a hospital in, much less to live in. Nor was the muddy, soggy terrain suitable for pitching tents. The unit had to scout around for a place to set up. Several members of the unit went over to Dachau and obtained entrance to the notorious concentration camp. It was a place of unbelievable horror and a sight that no one can forget. Guided by one of the prisoners, we visited the gas chamber where prisoners marked for extermination were sent. Outside the building was a huge pile of naked dead bodies, grotesquely sprawled one upon the other. The bodies were scrawny, emaciated, like wax dummies of skeletons. Slightly to one side lay a number of SS troopers beaten to death in sadistic revenge by the liberated prisoners. A stench of death hung in the air. It was all macabrely unreal. Stepping inside the building, one entered the reception room where incoming victims slated for extermination were told to undress in preparation for showers. Each person was given a bar of soap and a towel. Scarcely suspecting, they were told to enter the adjoining room which was marked “Shower-Bath” and a heavy steel door closed upon them. There was nothing alarming about the room which was of ordinary size. A number of apparent shower jets protruded from the ceiling. When the 250 victims were crowded into this room and the heavy steel door shut and locked, the “shower” was turned on. In approximately two minutes, the entire 250 would be dead of asphyxiation. Through a bin-like door that opened from the other side of the room, the bodies were shoveled into the crematorium. Here in a row stood four or five huge furnaces with square openings large enough for one or possibly two bodies to be thrown in. We could still see bones lying in the furnaces. Across the room, through an open door, we could see the storeroom for bodies awaiting the fiery ovens. It was a most sickening sight. Piled high to the ceiling was another mass of grotesque naked skeleton-like bodies, horribly unreal in death. The stench emanating from the room was overpowering. According to the inmate, perhaps a million people had been exterminated in Dachau’s gas chamber and crematorium — the largest percentage being persons brought there solely for the purpose of extermination and never seeing the inside of the prison stockade. Going out of the crematorium and around the building, we saw another open warehouseroom, loaded with another mass of dead bodies. Here the stench was even greater. The horrors of the camp were indescribable, but among the things we saw was a little garden-like enclosure where high-ranking military prisoners were made to kneel with bowed heads and were shot in the back of the neck, the long rows of kennels where huge-ferocious dogs were kept and set upon living prisoners hung just off of the ground, and the string of 50 boxcars on a siding just outside the camp crammed full of dead bodies. There were prisoners just arrived at Dachau who were awaiting entrance into the camp. For eight days they remained crammed inside the boxcars without food, water or sufficient air. A few that managed to break out and attempted to escape were shot and found with legs or arms hanging outside the cars. It was arranged for the entire unit to visit Dachau and see the horrors of the camp. It was something that every GI should have a chance to see.